EDX1000 as provider’s demar­cation point. EDX1000 con­verts long haul access to short haul inter­face. It builds the delivery point for provider’s SLA. Full management and band­width limi­tation features give the provider main­tenance and SLA options to dis­bur­den metro-switches and edge routers. The EDX1000 Family includes full managed compact Gigabit-Ethernet converters and repeaters, offering different number of Ethernet interfaces. arcutronix technology is a powerful way to enable the delivery of high quality broadband services throughout the entire CSA (carrier servicing area). 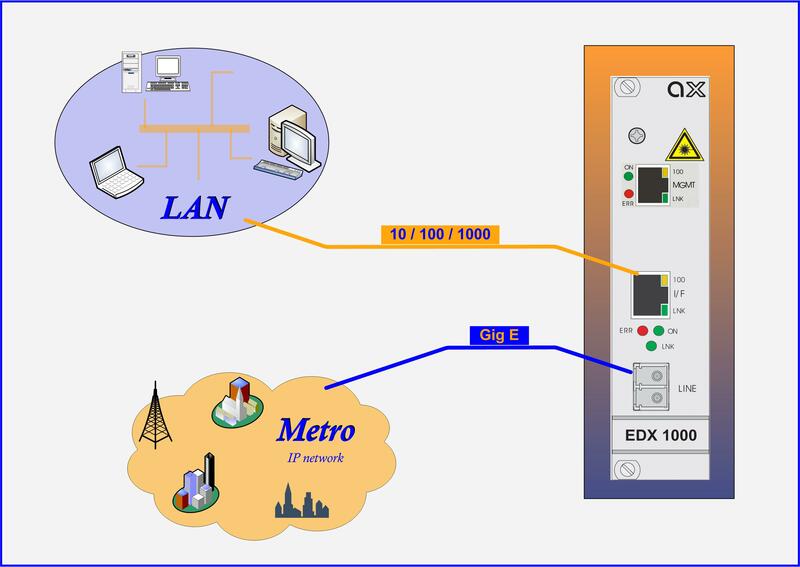 The EDX1000 Family members are designed as demarcation devices for provider’s network to connect 10/100/1000BaseT to optical GigE-links or to extend optical GigE-links. Thus terminating the optical Metro Ethernet or EFM-network towards the customer’s CPE. Due to VLAN tagging (acc. to 802.1Q) the EDX1000 Family is able to transparently interconnect networks of different customers and keep full privacy of data traffic. The EDX1000 Family offers full local and remote management access to give carrier class performance monitoring and a wide range of SLA settings via SNMP, CLI or web-based management. Due to that the EDX1000 Family consists of devices, which can easily operate all over provider’s network and offering full access and monitoring features. EDX1000 Family can be housed in small footprint single-slot housings or 19’’ racks.